Heather is one of my cousins. Our 'family', gets together every other year, to spend a week together to catch up and touch base with one another. Heather is also one of my 'friends' on facebook, and so that is how we stay in touch across these many miles. Anyways, I post an occasional card on my page, and Heather always has the nicest things to say. So, I wanted to make her a pretty Birthday card. Her birthday is tomorrow, so I won't post her card there until next week. 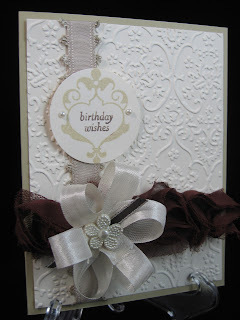 I got my inspiration from a challenge, Stampin' Celebration Inspiration Challenge #29. Here the colors were neutral except for one strong color. I know that I didn't use only Stampin' Up! products, but I am very happy with how the card turned out. (The brown 'rose' ribbon, hb stamp, the flower button, and the embosssing folder are non-SU! items.) Thank you for looking, and if you would like a complete list of products please contact me privately. Gorgeous!!! I love all the wonderful textures and fabulous ribbons. Beautiful monocromatic card. Thanks for playing with us at the Stampin' Inspiration Challenge!! Oh so pretty... love the ribbons! Thanks for playing along with us at the Stampin' Celebration challenge! Very pretty! I love all the different textures that you have, and great use of ribbon. Thanks so much for playing along with us at Stampin' Celebration!